Difference between Bare, Clear coat and Zinc Finishes - The Hairpin Leg Co. - Answer your questions. Left- Bare legs, These are un-coated raw steel. They will eventually rust if left untreated, perfect for a more industrial feel or ready for you to finish with your own choice. Center- Clear Coat, These still have all the charm and character of the bare steel but with protective clear coating that will last a lifetime. 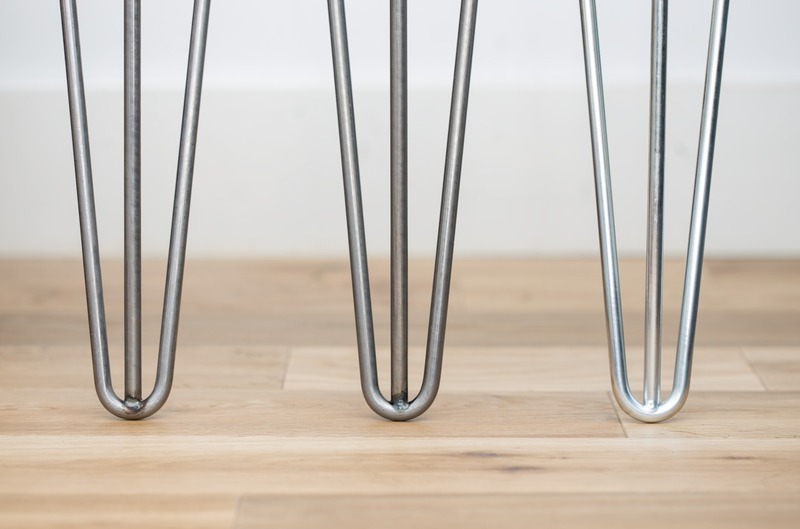 Right- Zinc(Silver), These legs have been electroplated in a zinc to give a bright, silver finish. This finish is extremely robust coating that will be suitable for outdoor use.